Born in Utrecht to a working-class family in June 1984, Wesley came from a family of footballers. With his two brothers keen and talented soccer players, it can be safely assumed that football flowed in his genes. Not surprising though, considering Netherland's great sport culture and work ethic. Sneijder kick started his career in AFC Ajax's youth academy. Treading the same path as his older brother he made his official Ajax debut on 2 February 2003 against Willem II in a record 6-0 win. Establishing himself quickly in the first team, he made his Champions League debut in the second group stage match against Arsenal on 26 February 2003. Sneijder was sold to Real Madrid for €27 million in late 2007 where he joined mates Royston Drenthe and Arjen Robben. He had the honor of donning the number 23, which was previously worn by David Beckham for four seasons but later on switched to the number 10 jersey following the exit of Robinho from Real Madrid. He moved to Inter Milan in August 2009 and soon found himself on the score sheet. Sneijder was named the UEFA Midfielder of the year 2009-10, a nice way to end the season after winning three trophies with Inter. Sneijder's eastward march continued as he joined Galatasaray in January 2013. The Champions League was Inter's third trophy of the 2009-10 season after winning the Coppa Italia and Serie A titles. Inter lost to UEFA Europa League winners Atletico Madrid in the 2010 UEFA Super Cup. Sneijder was shortlisted for the 2010 FIFA Ballon d'Or award, which Barcelona's Lionel Messi won. When Galatasaray beat Sivasspor 2-1 to win the 2012-13 Super Lig it gave Sneijder a league title in a fourth different country after winning the local leagues with Ajax in Netherlands 2003-4, Real Madrid in La Liga 2007-08 and a Serie A win with Inter in 2009-10. A prolific scorer, he has scored 26 goals in 96 International appearances while in domestic matches Sneijder has blasted the net 74 times in 278 appearances. Individually, he was awarded the 2010 Bronze Boot, the 2010 Silver Ball besides the Runners up medal in 2010 Soccer World Cup. His accurate passing ability earned Sneijder the nickname "The Sniper" by the media . He is currently married to Yolanthe Cabau van Kasbergen, a presenter and actress of Dutch-Spanish extraction since July 2010. Previously Ramona Streekstra was his spouse till 2009. Sneijder is known for close friendships including a strong bond with ex-teammate Javier Zanetti. Sneijder became a Catholic and was baptized in Milan. He is a man hardly known for any media scoops or controversies both on and off the pitch. 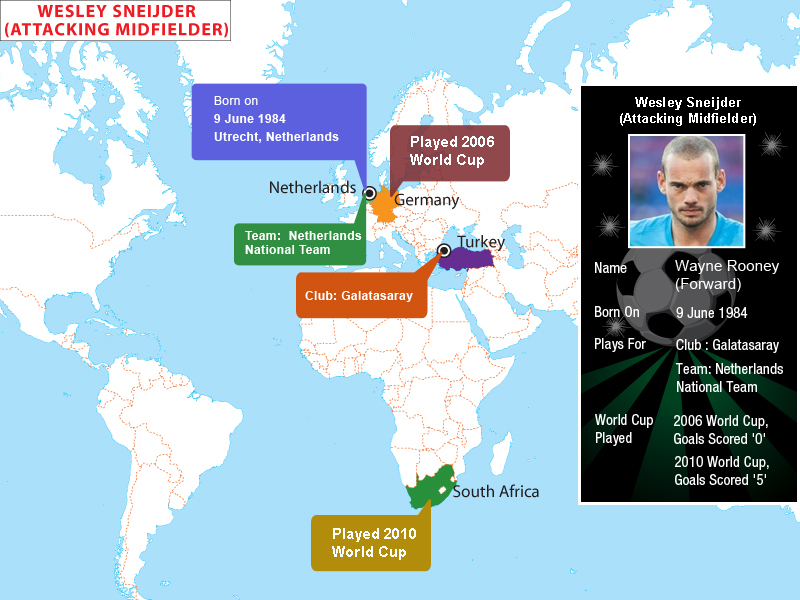 In 2010 however the absence of Sneijder's name from the Player of the Year award created ripples in the soccer world. Since 2010 was the first year which saw the merger of Ballon d'Or with the World Player of the Year award, a new voting system meant Sneijder lost out to Messi. However in the old system pundits believe that Sneijder would have edged out Messi. 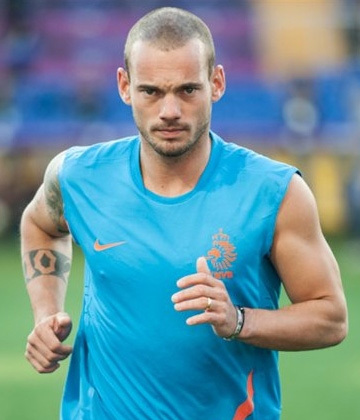 Sneijder has been the soul and the livewire of all the teams he has represented in the past. Through his accurate passing, ball control, and lethal free kicks Sneijder has been a true blue sharpshooter living up to his reputation as the Sniper.